The quotation is from the first chapter of Cien años de soledad, Gabriel García Márquez's 1967 masterwork about ... memory. The quotation contains the first two instances of the word pájaro or parrot. However, One Hundred Years of Solitude, Gregory Rabassa's English translation, simply translates this as bird. 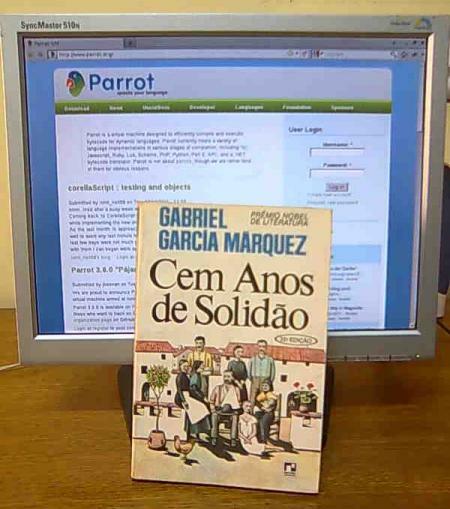 Our submitters had read this book in English, Portuguese or Spanish. Ville Koskinen, as first correct responder, will win the prize -- once we figure out what that is. Honorable mention to Lucas Buchala, who provided a photo of a Portuguese edition of the source taken in front of this very web page!